Visit the My Life As a…. website for more info and vocabulary words. Twelve-year-old Derek—a notoriously reluctant reader of everything but Calvin and Hobbes—would rather set the grass on fire with his sister’s old sunlamp than tackle his summer reading list. More than that, though, he wants to figure out why his mom’s acting so weird about the ten-year-old article he found from a Martha’s Vineyard newspaper entitled “LOCAL GIRL FOUND DEAD ON BEACH.” That mystery threads throughout this engaging middle-grade novel, told in a dryly hilarious first-person voice. Words like “impulse” and “discipline” are illustrated Pictionary-style by the author’s teenage son, mirroring Derek’s vocabulary-building technique: “My parents insist I use this system all the time, so I usually pretend I’m a spy being tortured by Super Evildoers who force me to practice ‘active reading’ or be killed by a foreign assassin.” When he’s not making avocado grenades, the smart-alecky Derek reveals himself as an endearing softy who loves his friends, family and dog and is even capable, in time, of befriending—horrors!—the class goody-goody. A kinder, gentler Wimpy Kid with all the fun and more plot. Meet twelve-year-old Derek, a perfect example of the kind of kid adults describe with loving exasperation as “all boy.” Derek fidgets, makes (with magic marker grids) grenades out of avocados, and, above all, doesn’t like to read required books. In Derek’s mind, summer means two months of liberation-that is, until his parents send him to Learning Camp so he won’t squander his intellectual potential. What they don’t realize is that Derek is an inquisitive child; an imaginative artist; and, in educational parlance, a visual learner. For not being much of a reader, Derek is a smooth narrator with a strong, humorous voice. He outlines the trials and tribulations of Learning Camp, especially in getting along with teacher’s pet Carly. Derek’s attempts to solve a mystery from his childhood connect the events of the story and divert readers from any hint of didacticism as he learns to build on his strengths rather than concentrate on his weaknesses. Cartoon drawings by the author’s teenaged son decorate the margins and not only re-create Derek’s illustrated vocabulary lists but also reduce the amount of text on each page, making the book more approachable for kids like Derek. Derek tells readers, “If my life were a book, I’d have my own cool adventures.” It is, and he does. project or two, and looking forward to a summer filled with water balloons, his friends and his dog. The last thing he thinks a summer should have is a summer reading list and a summer Learning Camp. Derek likes to read but he tends to really enjoy things like Calvin and Hobbes and Garfield. He would probably enjoy other books, too, but he doesn’t think it fair that people (let’s say teachers and parents, mostly) get to muddle in something as private as reading choice. I think that this quick, fairly short, big-fonted, wide-margined, illustrated book could be a pretty important one for a lot of people who think that literacy and being literate in the world only happens when you read “real” books. 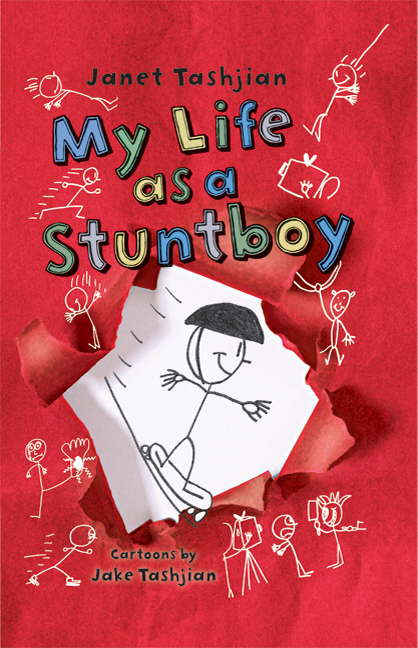 There is mystery, humor, and personal discovery, all good things for a book that will appeal to boys in particular, and especially boys of a particular age. My Life as a Book, My Life as a Stuntboy, and My Life as a Cartoonist were written for reluctant middle-readers, especially those needing extra visual support. Embedded in both books are techniques from Lindamood Bell’s Visualizing and Verbalizing as well as Reading Specialist Maryanne Wolf’s Rave-O program. The books are a great springboard to discuss how difficult reading can be, the pros and cons of summer reading lists, as well as tips and techniques for reading success. These books have been used in many citywide reads as well as parent/student book clubs. One of the things we see in our travels is that students are illustrating their own vocabulary words much the way Derek does in the books. Encourage your students to send their drawings into this website – we love to post illustrations from readers! Have them submit their vocab drawings here.